Many people own a laptop that is a few years old. Not everybody is a gamer who needs the most modern top-of-the-line system, nor a designer who needs to keep their computer as updated as possible. However, no matter how simple your needs are, soon you’ll start to see your computer slowing down. As you fill it up with data, the hard disk needs to move more and more to keep up with your work. This causes a huge performance bottleneck. Hard drives have moving parts, and these get worn down after some time. Fortunately, there is a simple solution to this: adding an SSD (solid state drive). These drives keep your data on flash storage that is ultra-fast, just as your phones and tablets do. By using an SSD, your computer will be able to boot faster, open your programs in a more efficient and speedy way, and in general turn your turtle into a rabbit. Not long ago SSDs were a luxury item which few could afford. Nowadays their price keeps dropping, and their capacities keep increasing. For a typical user, a 250GB drive would be enough, but they are available up to 4TB. 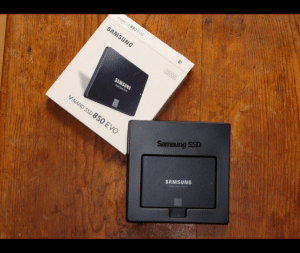 Take the Samsung 850 EVO 250GB 2.5-Inch SATA III Internal SSD, for example. It uses a unique and innovative architecture developed by Samsung, which they call 3D V-NAND. A revolution in the world of flash memories regarding density, performance, and endurance. 3D V-NAND flash memories are manufactured by vertically stacking 32 layers of cells. Thus, higher density and performance is achieved with lower energy consumption. It works faster thanks to TurboWrite. The TurboWrite technology offers optimal user experience thanks to its high performance read/write. The SSD 850 EVO Samsung provides sequential read speeds of 540 MB /s and write speeds of 520 MB / s, the highest in its category. This SSD comes with a software called Magician, which helps to improve performance and data processing even more by using any free DRAM as cache memory. It can also help you migrate all your data and applications from your hard drive. Application loading and performing multiple tasks at once will improve considerably with this drive. After using it, you’ll wonder how you managed to get any work done with your old, slow, outdated hard disk.